A house is covered in pink fire retardant as the Cranston Fire burns out of control near the town of Idyllwild in the San Bernardino National Forest on Wednesday. On Wednesday, the same day the blaze started, California fire authorities arrested Brandon McGlover, a 32-year-old man from Temecula. He has been booked into a detention center for “five counts of arson to wildland,” and it wasn’t immediately clear what his motivation might be. The Idyllwild area is also home to several summer camps, and the wire service reports that “several hundred children” were evacuated from them. Some were taken to a shelter set up at a nearby high school. The weather may complicate firefighting efforts. The area is under an excessive heat warning through Friday evening, and the National Weather Service warns the temperature could reach the 100s. “We’re throwing everything we can at it,” U.S. Forest Service spokesman Lee Beyer told the Times. That includes covering homes in flame retardant. Firefighters are also battling other large blazes in the state. 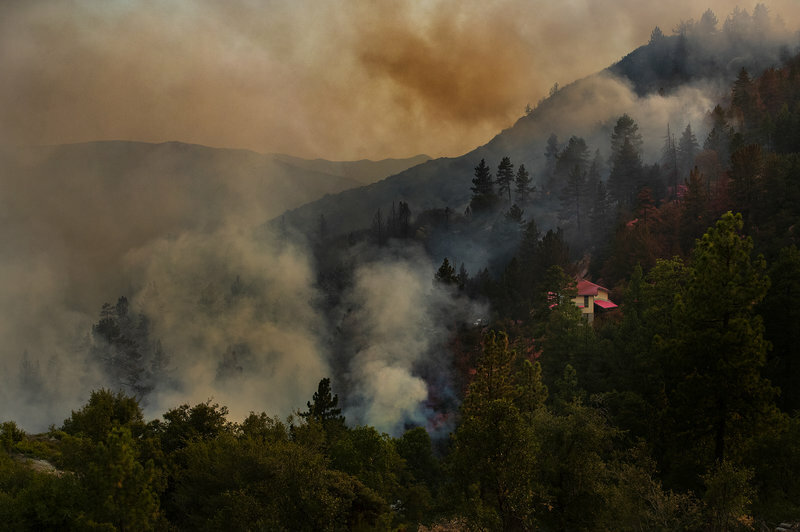 The Ferguson Fire in central California, which has grown to more than 43,200 acres, has forced parts of the nearby Yosemite National Park to close until at least Sunday. That includes marquee attractions such as Yosemite Valley, where visitors can see famous rock formations such as Half Dome and El Capitan. The park itself is not in imminent danger, but the areas are being used for fire operations and are also filled with unhealthy amounts of smoke. And in Northern California’s Shasta County, the Carr Fire has burned 20,000 acres and is just 10 percent contained.